The largest known jadeite source in the Aegean is located on the Cycladic island of Syros. The lecture “Jade axes in the Aegean and Anatolia. The emergence of a new network”, by Lasse Sørensen (Ancient Cultures of Denmark and the Mediterranean, The National Museum of Denmark), organized by Aegeus and the Swedish Institute at Athens, will be held on Friday, October 5, 2018, at the Swedish Institute at Athens (Mitseon 9, Athens). The largest known jadeite source in the Aegean is located on the Cycladic island of Syros. During sampling, several flakes and preforms of considerable age were identified, demonstrating, for the first time, the presence of several knapping places around the large jadeite boulders on Syros. 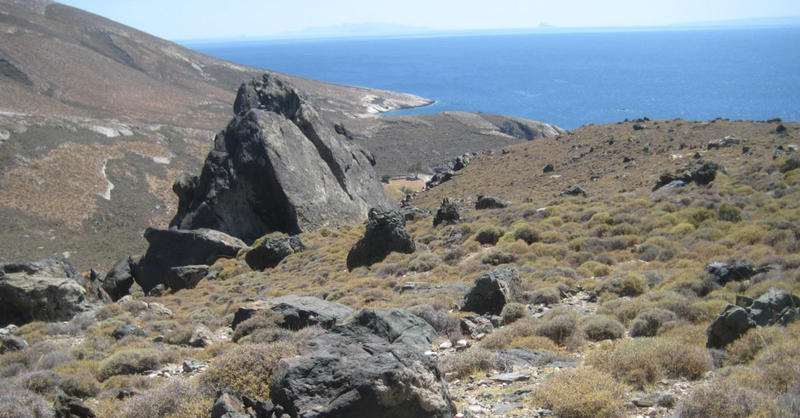 In order to classify the specific trace elements from the source of Syros a series of investigations has been initiated using radiospectrometry, XRD and ICP-analysis. In connection with the study of jadeitite axe assemblages in the Aegean and Anatolia several Neolithic and Early Bronze Age sites contain these rare objects, thus allowing comparison between larger geological jadeite and archaeological artefacts. The results indicated that some axes originated from the jadeite sources in the Italian Alps, others from the local source on Syros and some unknown sources, thus revealing larger network towards the Western and Eastern Mediterranean region. Another ground breaking result was the discovery of jadeitite axes originating from Syros, found at the site Çukuriçi Höyük in Western Anatolia. The axes were found in layers dated by C14 analysis to 6500 cal BC, making them the earliest evidence of jadeite exploitation in The World, which was contemporary with some of the first pioneering farmers in Western Anatolia.